The Professor’s Home was built on a hilltop by our great grandfather in various steps between 1890 and 1920. It is a traditional Piedmontese farmhouse, which was refurbished and modernized over the decades without overlooking the distinctive traits of country life: the hayloft, the big shed for the tools at the back, the large pavement for agricoltural work at the front. The thick brick walls keep the house cool even in the hottest summers, making air conditioning unnecessary; during the winter central heating is provided by a methane boiler; there are also two fireplaces, one in the kitchen and one in the living room, and the wood-burning stove can be used for heating as well as for cooking.The house rests on a large cellar, that hosts our tiny wine production. The rooms are large, each of them measuring about 30 square meters. An ADSL WiFi router covers all rooms, and a PC is dedicated to you, like the Petrof upright piano yearly tuned on 440Hz. In the house you will find hundreds of books in Italian, English, French, Latin and Greek. Two television set are available, one is connected to a satellite dish for free-to-air TV channels, as for a classical stereo turntable with vinile and a CD reader. Those wishing to take a deeper plunge into real country life can take part in the seasonal activities, such as fruit picking, grape and hazelnut harvest, wine-making, or help tend to the vegetable garden. Kids, too, can have a wonderful time at the house: they can play inside (see the “Puppet Show Room” in the photo gallery section) and outside, and have fun in the sandbox, the twin swing and the above-ground swimming pool we set up during the good season. We live in Asti and are always at hand to provide tips and advice to help our guests make the most of their stay! Computer Engineer, WW company employee, often working abroad. This was our family home for over a century, our parents put in the house all the money they had; now we rent it out as temporary residence to selected guests looking for a great alternative to hotels and B&B because we want to kep the house and surroundings in the best possible way. Big house full of old memorabilia, huge 2.5 acres property with vegetable garden, twin swing, sandbox, above ground swimming pool for boys and girls. Central point for visiting Alba, Turin, Milan, Genoa. Above ground swimming pool suitable for boys and girls. Stunning property, gorgeous views and just perfect! We stayed as our daughter had been invited to a wedding in Asti so decided to turn the opportunity into a week long family holiday. The farmhouse is huge! It has a real vintage feel everywhere and everything you need is available - a real 'home from home'. We stayed with our two grandsons and they loved the garden, the vines, the sunshine and shaded area to eat 'alfresco' whenever they wanted! The owner is amazing. Very friendly and helpful but not intrusive. Angelo booked us into the local restaurant in Roatto (they opened especially for us!) and we had a seven course meal with wine and mineral water for 20 euros each, this was fantastic value and the food was AMAZING and real Italian home cooking. I felt very safe in this area, the locals were so helpful and the scenery was just perfect. The local shop has beautiful hams, salami and local cheeses (and wine) which are well worth trying as they are delicious. All in all one of our best holidays. Thank you Angelo. Thank you Mark for the kind words and the appreciations! we continuously work for keep the house and the property in the best possible way, and your description is what we need to continue our efforts. We will give your compliments to the local shop and the restaurant! We hope to host you again. Lovely house and location and very helpful owner. Antique furnishings and old world atmosphere but with all modern conveniences. Just as we like it. The location was prefect for wine touring and getting to know the Piedmonte region. Angelo was welcoming and accomodating helping us find dinner our first night - no easy task due to our late arrival - at a wonderful place with reasonable prices and excellent food. The house was fully equipped, a historical treasure trove that we were thrilled to get stay in and our stay was truly a vacation. Angelo shared his family history and the history of the area making us feel at home. He directed us to services, local markets and sightseeing of interest. We could ask no more of a host. Our only request would be newer beds but I think as rather soft Americans we may expect too much! The rooms were beautifully furnished and we were thrilled to have a computer and wi-fi access to touch base with our families at home. The supply of reading material was endless and varied - a bonus for us book lovers. We would highly recommendation the accomodations and the area! We saw so much of the region without having to venture very many miles any direction. "The house was beautiful, surounding was amazing. the kids liked the swimming pool very much. Beacause the house was on the top of the hill, you realy have a beautiful view of the landscape. Further on the owner Angelo P. speaks very good english, and we got a lot of information about the neighbourhood. 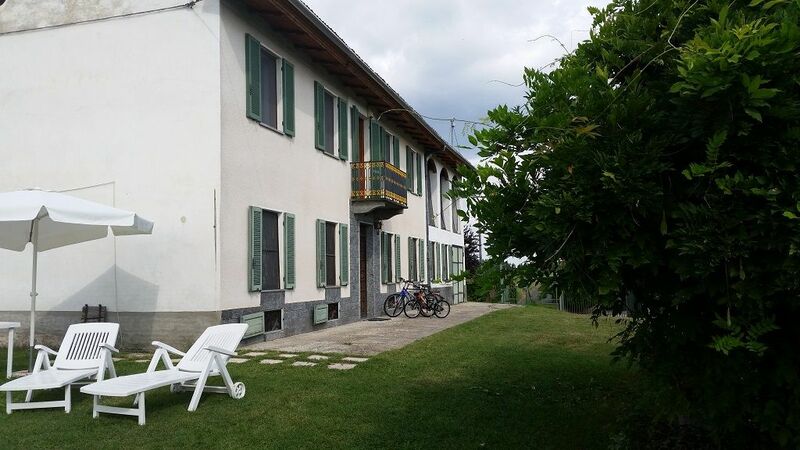 When you are traveling with a big family or 2 families, I realy recommend this house"
"My family and I had great time in the Professor's house in Roatto, near Asti. The house and garden are wonderful for kids; ours loved exploring the many rooms and playing in the garden. The owner, Angelo, went out of his way to be hospitable and helpful with tips for restaurants and sightseeing in the area. The local alimentari has great cold cuts and wine, while the nearest agriturismo (Crotin) has wonderful Piedmontese food. We would love to go back." "A lot of effort has been taken to keep and restore the house and furniture thus giving it a lot of character. A huge collection of books. Mr. A. speaks excellent english and guided us keenly and welcomed us with a huge italian food hamper! Thanks for that. We had a great stay. Roatto is a little village near Alba and Asti on a hilltop surrounded by forests and other small villages; you will find around many interesting places, restaurants and XIII century churches (we can advise, if you like). The house is surrounded by our hazelnut trees, green fields, a vineyard and a vegetable garden. A very good butcher's and grocer's shop is at walking distance, and all services (supermarket, railway station, two banks and so on) are only 3 miles from the house. - Alba (30KM): Nice town, famous for truffles and Ferrero Nutella production; many villages around Alba are now inside a UNESCO World Heritage site.